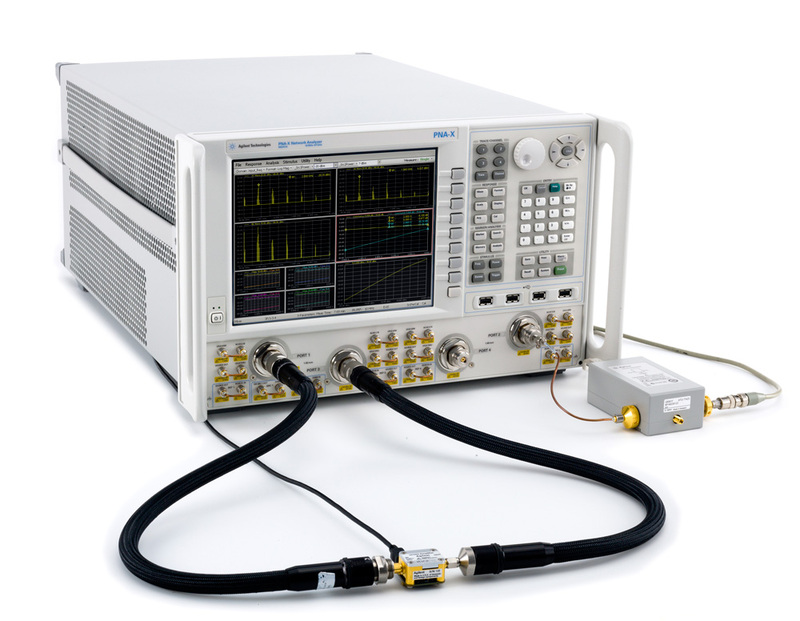 Agilent Technologies Inc. (NYSE: A) has expanded its award-winning PNA-X Nonlinear Vector Network Analyzer to 67 GHz. A new 67-GHz phase-reference calibration standard, configured to work with the 67-GHz PNA-X NVNA, is also now available. Using this hardware, designers can easily characterize and model components accurately up to frequencies of 67 GHz. In addition, X-parameters can be measured up to 67 GHz, providing an accurate model of linear and nonlinear component behavior at very high frequencies and wide bandwidth. Agilent's NVNA and Advanced Design System software mark the industry's first measurement and simulation environment for designing nonlinear components. The result is the highest level of insight into nonlinear device behavior, making the combination especially useful for scientists researching new RF technologies and engineers involved in designing today's high-performance active devices. The NVNA measures X-parameters, a new category of nonlinear network parameters for deterministic, high-frequency design that can be used to characterize both a components' linear and nonlinear behavior. The new 67-GHz NVNA enables engineers to make high-frequency nonlinear measurements across a very wide frequency bandwidth. The 67-GHz phase-reference calibration standard - an industry first - enables accurate and traceable nonlinear measurements to 67 GHz using the NVNA. The phase reference generates a comb of frequencies from 10 MHz to 67 GHz with a known cross-frequency phase relationship traceable to the National Institute of Standards and Technology. This relationship calibrates the NVNA to measure spectrum to 67 GHz with a predictable and accurate cross-frequency phase. With this capability, it is now possible to do characterization and X-parameters modeling of active components like transmit and receive modules where accurate measurement and prediction of harmonic content and distortion to 67 GHz is required. T/R modules typically operate in the 20-GHz fundamental frequency range and consist of power amplifiers, low-noise amplifiers and mixers. Characterizing the module's nonlinear behavior requires measurement up to the third harmonic (60 GHz), with a converter down-converting a 65-GHz signal to an intermediate frequency of 500 MHz. Using the 67-GHz NVNA, engineers can accurately characterize the amplitude and cross-frequency phase relationships of the down-conversion and resulting distortion across this wide frequency range. High frequency up-down converters and low-noise amplifiers can be measured and modeled using X-parameters within Agilent's Advanced Design System, which provides complete system design capabilities. "Accurately measuring and reducing a component's nonlinear behavior at higher frequencies is crucial to creating linear system solutions for aerospace and defense applications," said Gregg Peters, vice president and general manager of Agilent's Component Test Division. "Our 67-GHz phase-reference calibration standard and NVNA provide component characterization and X-parameters to quickly, easily and, with the highest degree of accuracy, measure and model nonlinear behavior. With its full-match correction, accurate amplitude and cross-frequency relative phase information, the NVNA is setting a new standard in accuracy and insight into nonlinear component behavior." More information on the NVNA is available at www.agilent.com/find/NVNA. An image of the new 67-GHz NVNA and phase reference-calibration standard is available at www.agilent.com/find/67GHz_NVNA_images. Agilent Technologies Inc. (NYSE: A) is the world's premier measurement company and a technology leader in chemical analysis, life sciences, electronics and communications. The company's 18,500 employees serve customers in more than 100 countries. Agilent had net revenues of $5.4 billion in fiscal 2010. Information about Agilent is available at www.agilent.com.